All transactions are safe and secure with a reliable history in online purchasing behind each of our associates. Buy the It's a Dirty Job but Someone's Gotta Do It Dirty Jobs Theme Song t-shirt to own Dirty Jobs clothing and merchandise. "It's a dirty job but someone's gotta do it," echoes the lyrics of the Dirty Jobs theme song. The lyrics are from the Faith No More song "We Care a Lot." In the first half of 2007, the familiar opening tune was replaced with a generic theme song due to rights issues. The issues were resolved in June of that year and the original Dirty Jobs theme returned. 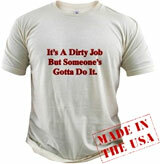 In addition to the It's a Dirty Job but Someone's Gotta Do It Dirty Jobs Theme Song tee above, browse the Dirty Jobs Clothing Gallery for more apparel like men's and women's clothes, kids shirts or hoodies.